MALLORCA’S expat community has rallied round Debbie Cameron and daughter Laura Joyce following their arrests last week. Friends have spoken of their ‘shock’ after Brits Cameron, 59, and Joyce, 28, were held over an alleged €60 million sickness-claim scam involving UK tourists. Joyce, who is eight months’ pregnant, appeared in court with four alleged ‘claims farmers’ last week, after the family’s Bendinat villa was raided. Cameron, who denied the claims and was released the following day, has hired top lawyer Jaume Riutort, famous for securing the acquittal of Princess Cristina, King Felipe’s sister, over alleged tax evasion. But people close to the family have expressed surprise over last week’s arrests. “I am massively shocked,” said one friend. “Debbie is very religious and does a lot of work with charities. A young hairdresser from Cambridge and a middle-aged woman from Edinburgh are among those alleged to have been paid commissions for providing bogus ‘victims’. 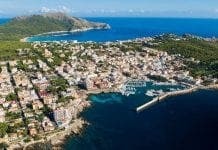 The pair are said to have enlisted the holidaymakers and filed over their information to UK lawyers who made the fraudulent compensation claims. Another friend of Cameron’s said ‘I can’t believe she would have any involvement in it or know what was going on’. Altogether, seven people, several of them Brits, were arrested in last week’s raids on four homes and two businesses in Portals Nous, San Agustin and Bendinat, with Joyce allowed to return to her family last Thursday. Self-professed ‘rich mum’ Cameron, originally from London, and Joyce were detained during the raid on a luxury property in Bendinat. Meanwhile large quantities of documents were seized at a popular sports bar in Portals Nous, run by Laura’s husband Stuart Joyce. Another friend said: “I’m pretty shocked by it. Laura was always nice to me and always looked after her staff. 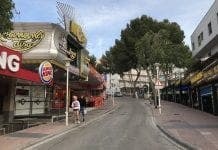 A Guardia Civil spokesperson confirmed that an investigation into the allegedly fraudulent claims began at the end of May after Alcudia hotel bosses filed denuncias with the police. Last month, leaked police documents revealed that Mac Hotels had allegedly been hit with €4m of sickness claims, some 800 altogether. Claims are made against UK tour operators, who then deduct payments and legal fees from Spanish hotels. The Olive Press contacted Riutort’s law firm for comment, but had not heard back at the time of going to press.